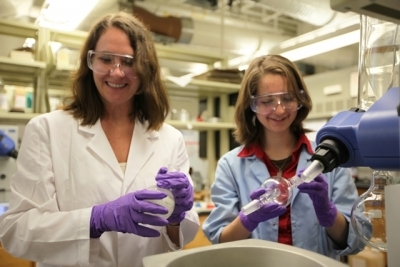 Her student, Corrine “Nina” Elliott, works to synthesize and study new compounds for overcharge protection in lithium-ion batteries — essentially creating chemicals which can be added to batteries to make them safer and more efficient. 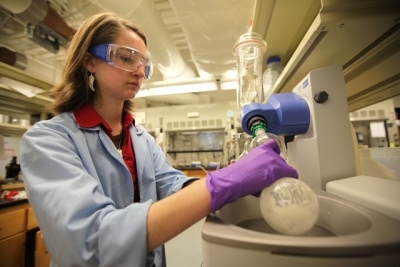 Elliott won first place in chemistry at her regional and state science fair competitions, and presented this research at the Intel International Science Fair, all as a high school student. Since this meeting in the spring, 18-year-old Elliott graduated from Paul Laurence Dunbar High School and plans to attend UK in the fall. She began working in Odom's lab in the fall of 2011 as a high school junior, on a project involving specific organic molecules and their utility in lithium-ion batteries. "I create what’s called a 'redox shuttle,'" Elliott said. "If too much electrical energy is forced into a [rechargeable] battery, then the redox shuttle will put it to a productive purpose, or at least divert it from harming the battery itself… It gets rid of that extra energy in order not to harm the battery." This research has significant implications. Odom said that if Elliott finds the right derivative of the chemical phenothiazine to enhance the performance and efficiency of lithium-ion batteries, the product could immediately go to market. For Elliott, the lab represented a new sense of belonging, allowing her to be among the first people working there, as well as an opportunity to catapult herself ahead of the curve in research. For Odom, Elliott's involvement in the lab provided a window for her to watch and help a developing scientist emerge. "It's been amazing to watch Nina mature as a young scientist in the laboratory," Odom said. "It was clear early on that she was a bright student, but it was not long until she surpassed my expectations, both in her understanding of her project and in the amount of work she has accomplished. She quickly picked up synthetic techniques that advanced undergraduate and graduate students learn, including setting up reactions for which oxygen and water must be rigorously excluded." After recognizing Elliott's work ethic and potential, Odom said she realized the importance of exposing her to scientists outside of the laboratory. She brought Elliott to the 244th National Meeting of the American Chemical Society in Philadelphia, Penn., not to present formally at the meeting, but instead to attend presentations and meet with a variety of professors. At the 245th ACS meeting in New Orleans, Elliott presented her research poster among a group of undergraduate, graduate and postdoctoral researchers. "I was very proud of my presentation," Elliott said. "I think that my public speaking improved as I presented at various venues, which will help me in the long run. Also having the contacts will certainly help me succeed at the university." Odom said that she at first hovered in the background of Elliott's presentation to see if she needed help answering questions delivered by Ph.D. scientists. "Soon it was evident that she was well prepared to answer even the most difficult questions and was ready to be on her own," Odom said. Elliott worked in Odom's lab as a paid assistant throughout the summer of 2013, and plans to continue her research in the fall of 2014 as a freshman. Interested in computational research, Elliott plans to major in mathematics at UK and is considering minors in statistics and chemistry. "It's funny because I always thought that I was far better at English than I was at math," Elliott said. "But math has logic to it; It makes sense to me. So, I suppose the logic behind math and to an extent behind chemistry is why they both fit me so well. I have a penchant for following logical trains and figuring out what the next logical step would be." And the next logical step? Odom has watched the young scholar in action long enough to know, she's likely to leave some pretty big footprints.